The FCC has denied the 2015 petition of a Missouri radio amateur seeking to have the Commission authorize low-power experimental activity on Amateur Radio frequencies. James Edwin Whedbee, N0ECN, of Gladstone, sought to amend FCC Part 97 Amateur Service rules to let radio amateurs conduct experiments on all Amateur Radio bands, subject to certain limits on duration, power, and bandwidth. The FCC declined to put his petition on public notice and invite comments. "[T]he Commission's rules contain numerous provisions for experimentation and development of new radio equipment and techniques," the FCC said in a June 9 letter to Whedbee. "The Experimental Radio Service (ERS) rules contained in Part 5 permit a broad range of experiments, including in the Amateur Service, and prescribe the manner in which the radio spectrum may be made available to experiment with new radio technologies, equipment designs, characteristics of radio wave propagation, or service concepts related to the use of the radio spectrum." The letter pointed out that the FCC "recently revised and streamlined" its Part 5 rules "to provide additional flexibility to innovators" and noted that Whedbee did not discuss in his petition whether those rule changes might address his concerns. In the same stroke of the pen, the FCC denied a 2016 petition from Whedbee seeking to delegate to the chiefs of the Wireless Telecommunications Bureau (WTB) and the Office of Engineering and Technology (OET) the authority to dispose of certain requests for exemptions, waivers, and rulemaking regarding new technologies or new application of existing technologies. "The Commission has already delegated to WTB and OET authority to act on applications, waiver requests, petitions, and even some rulemaking matters, so long as they do not raise novel questions of law or policy which cannot be resolved under outstanding Commission precedents and guidelines," the FCC told Whedbee. "[W]e conclude that [both] petitions present no evidence of an existing problem or other evidence meriting a rule change, and we dismiss the petitions," the FCC concluded. Whedbee is no stranger to the FCC petition process. Earlier this year he petitioned the FCC to designate Morse (radiotelegraphy) Amateur Radio band segments as "symbol communication" subbands, and the FCC invited public comment on that request (RM-11769). In 2012, the FCC turned down Whedbee's request that the FCC declare homeowners associations' covenants, conditions, and restrictions (CC&Rs) unenforceable. 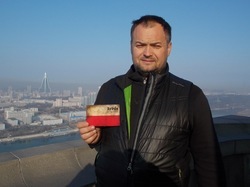 In the wake of a surprise "demonstration" operation from North Korea -- officially the Democratic People's Republic of Korea (DPRK) -- in December, Polish DXer Dom Grzyb, 3Z9DX, is eagerly awaiting the call that will allow him to return to the most-wanted DXCC entity for another brief activation. Just when that will come could be anytime, however. DX-World and The Daily DX report that Grzyb has received confirmation that North Korea will authorize a 5-day operation, and he is ready to roll as soon as he gets word, which will be on short notice -- just enough time for him to book his flight, grab his gear, and head off. DX World reported that no notice would be given prior to the P5/3Z9DX activation itself. Dom Grzyb, 3Z9DX, during an earlier visit to North Korea. There are other conditions: He may only operate on SSB and on one band, 20, 15, or 10 meters. No decisions will be made until Grzyb gets to the DPRK, however. Three radio amateurs on board the International Space Station (ISS) will depart the orbiting outpost at the end of the week. Expedition 47 Commander Tim Kopra, KE5UDN; Flight Engineer Tim Peake, KG5BVI/GB1SS, and Yuri Malenchenko, RK3DUP, will undock from the space station early on Saturday morning, June 18 (the evening of Friday, June 17, in US time zones) in a Soyuz TMA-19M spacecraft commanded by Malenchenko, after having spent 186 days in space since their December launch. NASA Television will provide coverage starting on June 17. When the Soyuz undocks, ISS Expedition 48 will begin under the command of Jeff Williams, KD5TVQ. Williams and crewmates Oleg Skripochka, RN3FU, and Alexey Ovchinin will operate the station for 3 weeks until the arrival of the next crew increment. NASA astronaut Kate Rubins, KG5FYJ; Russian cosmonaut Anatoly Ivanishin, and Takuya Onishi, KF5LKS, of the Japan Aerospace Exploration Agency are scheduled to launch on July 6 from Baikonur, Kazakhstan. During their stay, Kopra and Peake scored some milestones for the Amateur Radio on the International Space Station (ARISS) program. On March 10, Kopra conducted the 1000th ARISS school group contact with students in North Dakota. The first contact occurred in December of 2000. Peake made use of Amateur Radio in his "Principia Mission" outreach, which aimed to directly engage students with communication technologies, inspiring them to pursue careers in science, technology, engineering, and math (STEM) fields. During his stay in space, Peake hosted 10 ARISS school group contacts, including the first to take advantage of the HamTV digital Amateur Radio television (DATV) system when he spoke with students in England on February 11. The DATV system in the Columbus module of the ISS allowed students at Royal Masonic School, home of GB1RSM, to see as well as to listen, as Peake, operating as GB1SS, answered their questions about life in space. Read more. One of the rarest locations in the National Parks on the Air (NPOTA) program will be activated on Saturday, June 18. The HacDX Amateur Radio Club, W3HAC, has secured permission to operate from the White House Visitor Center (DZ10), during ARRL Kids Day. Announced frequencies are 14,270, 7270, 14,042, and 7042 kHz from 1800 to 2300 UTC. The group, which has secured the call sign W3H for this activity, plans other NPOTA Activations on August 25 -- the actual date of the National Park Service's 100th anniversary -- and in October for Scouting's Jamboree On the Air (JOTA). There are 55 NPOTA activations on the calendar for June 16-22, including Mesa Verde National Park in Colorado, and the James Garfield National Historic Site in Ohio. Details about these and other upcoming activations can be found on the NPOTA Activations calendar. "Grounding" is the topic of the latest (June 16) episode of the "ARRL The Doctor is In" podcast. Listen...and learn! If you've never listened to a podcast before, download our beginner's guide. Just ahead: "Are Linear Amplifiers Really Worthwhile?" ARRL Field Day -- the most popular operating event of all -- is June 25-26. 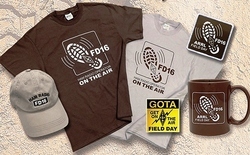 There's still time to show your support for ARRL Field Day with official merchandise. Shirts hats, pins, patches, and coffee mugs are a great way to acknowledge -- and commemorate -- your participation in this annual event. Encourage family, friends, and fellow hams to take part in ARRL Field Day with recruitment posters and attractive "Get on the Air" (GOTA) pins for newcomers. Get out...get on the air...and leave nothing but footprints! Order your 2016 ARRL Field Day merchandise from the ARRL online store or call (888) 277-5289 in the US, Monday through Friday, from 8 AM to 5 PM Eastern Time. Outside the US, call (860) 594-0355). While supplies last. Kids Day is Saturday, June 18, from 1800 to 2400 UTC. The twice-yearly (January and June) event, sponsored by the ARRL and The Boring (Oregon) Amateur Radio Club, is an excellent opportunity to showcase Amateur Radio to youngsters and even to hand over the keys, so they can get some hands-on hamming experience. Share the excitement with your own children or grandkids, or with youngsters in the neighborhood! 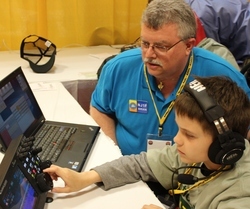 For youngsters, their positive ham radio experience may foster an interest that may lead them to become radio amateurs. For veterans, it's a chance to share their stations and affection for Amateur Radio with the next generation. To solicit contacts, call "CQ Kids Day." The suggested exchange is name, age, location, and favorite color. There is no limit on operating time, and stations may work each other more than once if the operator has changed. Repeater contacts (with permission of the repeater's sponsor) are okay too, and satellite contacts may provide a real thrill. Observe third-party traffic restrictions when making DX contacts. All participants are encouraged to post stories and photos to the Kids Day Soapbox page and are eligible for a colorful certificate. You can download the free certificate, customized with the youngsters' names, after filling out the Kids Day Survey found on the same page as the certificate generator. Alternatively, you can send a 9 × 12 SASE to Kids Day Certificate Request, ARRL, 225 Main St, Newington, CT 06111. Six meters sounded more like an HF band during the ARRL June VHF Contest over the June 11-12 weekend, as sustained sporadic E (also known as E-skip or Es) openings greeted participants. Some found 6 meter contacts so bountiful that they tended to neglect the other VHF/UHF bands, where conditions were more typical. "As for why the contest weekend was so good, all I can say is that June can be good for E-skip," said Carl Luetzelschwab, K9LA, the former "Propagation" editor for National Contest Journal (NCJ). "I think the term 'sporadic' in its name is well suited. We just don't understand the detailed processes of 6 meter Es." The well-appointed VHF-UHF tower at K2DRH. For many, it was a 6-meters-only event, with the best conditions in several years and much of the action on CW. "This was the consummate 50 MHz festival, with wide-open bands throughout most of the contest," Bill Schwantes, W7QQ, in New Mexico, posted in his soapbox comments on the 3830 website. "For the first time in my memory I felt like a rate junkie, often reaching 200 per hour. What fun on 6, while ignoring long-haul, weak signal contacts on 144, 222, and 432." Bob Striegl, K2DRH, who boasts some serious VHF-UHF antennas in upstate Illinois, said the band "was going crazy" in the evening from the East Coast to Europe, and to Japan from the Midwest and South. "In a lull I tuned up JA7QVI, who was the strongest, and worked him on CW with low power!" 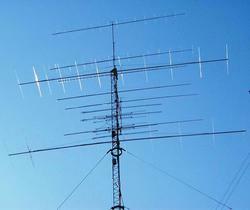 Mike Smith, VE9AA, in New Brunswick called it, "A VHF (6 meter) contest I can write home about." He was one station's first 6 meter contact, and "was tickled to do that." Top-tier HF contester Dan Street, K1TO, in Florida, made his first 6 meter contact with Japan during ARRL VHF, only the third time he's operated in the event. "Conditions were amazingly different for all of us," Street said in his soapbox post. "I watched in awe as the W1s seemed to have a contest-long opening to somewhere. EA8DBM's skimmer made an incredible number of US spots, and he worked stations out to the West Coast. Yet here in Florida, I never heard him once, nor even one European." Eric Gruff, NC6K, in California also didn't get in on the excitement. "Another frustrating VHF contest from DM13," he posted. "[T]he majority of the time, I spent listening to the same local stations calling CQ incessantly, while the rest of the country was enjoying a huge opening." Charlie Panek, KX7L, in Washington, summed things up this way: "Every few years the planets line up right, and we get a good Es opening during the contest," he said. "This was one of those years!" Read more. The White House will honor Adafruit founder Limor "Ladyada" Fried, AC2SN, on June 17 as one of 10 "Champions of Change for Making." According to the announcement, while an engineering student at MIT, Fried became determined to create a company that focused on supporting the learning of electronics for makers of all ages and skill levels. "These individuals were selected by the White House for their personal passion and tireless efforts to make advances in technology and platforms, educational opportunities, or spaces that empower even more Americans to become tinkerers, inventors, and entrepreneurs," the announcement said. 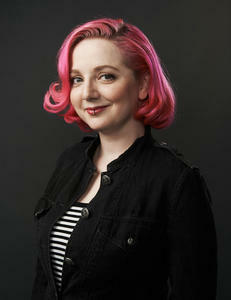 Fried founded Adafruit in 2005, and it has grown to now employ more than 100 individuals in a 50,000 square foot factory in New York City. As the company's sole owner, she has committed to building both innovation and community, and is known for creating resources for learning. "When Limor Fried looks at a circuit board, she sees it as a series of aesthetic choices -- a vehicle for self-expression, rather than simply the product of rational optimization," Nicola Twilley wrote in the March 3 edition of The New Yorker magazine. Twilley quoted Fried as saying, "I want to show people that engineering isn't something cold and calculated. Thinking like an engineer is a beautiful and fascinating way to see the world, too." Fried was the first female engineer on the cover of WIRED magazine, and she was named Entrepreneur of the Year in 2012 by Entrepreneur magazine. She also served on the NYC Industrial Business Advisory Council. Adafruit has expanded its offerings to include tools, equipment, and electronics, which Fried personally selects, tests, and approves before they go into the Adafruit store. The White House will live stream the recognition ceremony on Friday, June 17, at 1700 UTC. Read more. 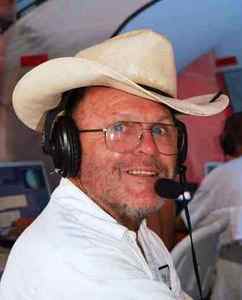 Well-known DXer and DXpeditioner Milt Jensen, N5IA, of Virden, New Mexico, died on June 10 after falling from an Amateur Radio tower. An ARRL Life Member, he was 73. According to the Pima County Sheriff's Department, Jensen was working on a tower on Arizona's Mount Lemmon when he fell. He was pronounced dead at the scene. The mishap is still under investigation. Milt Jensen, N5IA, during the Ducie Island DXpedition in 2008. "Milt was on one of his many tower climbing adventures, and, by no choice of his, it became his last," his oldest son, Jason, wrote in a QRZ.com post. Licensed in 1960, Jensen had lived in Virden for his entire life. Especially well known for his 160 meter activity, he spent several years constructing an "8-circle array" of full-sized 160 meter verticals -- each 125-foot towers -- at his station site south of Safford, Arizona, near the New Mexico border, Lee Finkel, KY7M, wrote in an article set to appear in the July/August issue of NCJ. Jensen operated his "dream station" remotely from his home, often using the call sign N7GP in contests. In addition to his Top Band operation, Jensen was heavily involved in designing, installing, and maintaining VHF and UHF mountaintop repeaters, remotely controlled base stations, and linking systems. As a contester, he often landed in the Top 10 standings. Jensen participated in three DXpeditions. He and his wife Rulene, KB5VTM, were part of the 1998 XZ1N team in Myanmar. In 2000, he returned to Myanmar as part of the XZ0A multinational team. In 2008, he was part of the Ducie Island VP6DX DXpedition team. Read more. 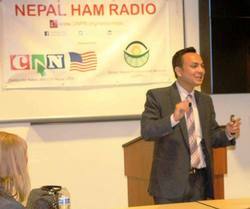 Amateur Radio's "vital role" in the 2015 Nepal earthquake response was the topic on June 2 as the City of Santa Clara, California, hosted Sanjeeb Panday, 9N1SP, of Tribhuvan University in Kathmandu Nepal. Given that the Silicon Valley and the Kathmandu Valley share the common geography of multiple, nearby earthquake fault lines, the subject was relevant. The Santa Clara Fire Department sponsored the presentation, with an eye toward applying the lessons learned in the wake of the Nepal earthquake to better prepare for a similar disaster in the Silicon Valley. Sanjeeb Panday, 9N1SP, spoke in Santa Clara, California, on June 2. "The Nepali people have gone through a tremendous ordeal," Panday told the audience. "If our experience can help others in different parts of the world [to] better prepare for disasters, then this can be regarded as a positive outcome." Nearly 100 spectators attended Panday's presentation, including firefighters, emergency response officials, City of Santa Clara ARES/RACES members, Bay-Net participants, and members of the Nepali-American Community. Scout leader Richard Silkebakken, KM6CPH, and members of Cub Scout Pack 32 (Monterey Bay Council) presented Panday with two handheld transceivers for delivery to Scouts in Nepal. Also during the event, the office of US Rep Mike Honda presented the Global Nepali Professional Network (GNPN or CAN-USA) with a "Certificate of Special Congressional Recognition." Through its Radio Mala program, GNPN funded and helped to construct the only two Amateur Radio repeaters available in Nepal during the earthquake. Panday was in the US to attend the International Microwave Symposium (IMS), where he addressed a panel on Amateur Radio in post-secondary education. On June 1, he also spoke to the US Geological Survey. Second-generation Nepali-American Suresh Ojha, W6KTM, said he was gratified that the academic community and US jurisdictions are looking at Nepal's earthquake experience with an eye to applying the lessons learned to the challenges faced in the US. Read more. ARRL will be well represented this month at Europe's premier Amateur Radio gathering -- Ham Radio 2016. The 3-day event, in Friedrichshafen, Germany, on the shores of Lake Constance, gets under way on June 24. 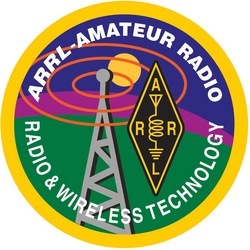 ARRL President Rick Roderick, K5UR, will head the League's contingent to Friedrichshafen, which also will include International Affairs Vice President Jay Bellows, K0QB; CEO Tom Gallagher, NY2RF; Marketing Manager Bob Inderbitzen, NQ1R; Assistant Field Services and Radiosport Manager Norm Fusaro, W3IZ, and retired CEO David Sumner, K1ZZ. The annual show attracts upward of 15,000 visitors from around the globe. The co-sponsoring Deutscher Amateur Radio Club (DARC) has set a theme of "Amateur Radio -- On land, on water, and in the air" for this summer's event. Some 200 exhibitors from 34 countries will be on hand for this 41st "Friedrichshafen." 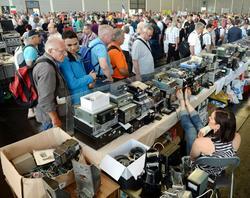 The indoor flea market at Friedrichshafen always draws a crowd. "There are as many different ways to operate Amateur Radio as there are places from which you can send radio transmissions: On land, on water, and in the air," DARC spokesperson Stephanie Heine, DO7PR, said. This year's program includes a "foxhunt" in woods near the fairgrounds, a youth camp, and the Ham Rally, where the next generation of radio amateurs can explore the world of technology and wireless. It's open to young people between the ages of 8 and 18. A Contest University (CTU) sponsored by the DARC will take place for radiosport beginners on Friday, June 24, and experienced contesters on Saturday, June 25, with sessions aimed at how to improve contesting performance. IARU Region 1 will host a meeting of those interested in emergency communication on Friday, June 24. The session will include an open forum for national coordinators to report on activities in their respective countries. Also up for discussion will be GlobalSet and changes to the IARU emergency message procedure. International Amateur Radio Union (IARU) President Tim Ellam, VE6SH/G4HUA, will head the IARU team to Friedrichshafen, along with IARU Vice President Ole Garpestad, LA2RR, and IARU Secretary Rod Stafford, W6ROD, a past ARRL president. Next year's big show in Friedrichshafen will take place July 14-16, owing to a scheduling conflict. Read more. Tad Cook, K7RA, Seattle, reports: It was a little scary to see the daily sunspot number at zero for 4 days -- June 3-6 -- but conditions seem to have recovered nicely. The average daily sunspot number for our June 9-15 reporting week was 29.1, up from 7.7 the previous week. Due to the way sunspots are counted, the minimum non-zero sunspot number is 11. A sunspot number of 11 means there is one sunspot (counting as one point) in one sunspot group (adding 10 points). A second sunspot raises the sunspot number to 12, unless that spot is on its own and not clustered with the other spot, in which case the sunspot number would be 22. So, that average daily sunspot number of 7.7 from the previous week is due to the fact that 4 out of the 7 days had sunspot numbers of zero; you would never see a day with an actual sunspot number of 7.7. Average daily solar flux this week was 88.3, up from 80.7. Predicted solar flux for the next month is pretty flat, at 85 on June 16-30; 80 on July 1-5; 85 on July 6-9; 92 on July 10-11; 95 on July 12-18; 92 and 90 on July 19-20, and 85 on July 21-27. Predicted planetary A index is 18, 12, and 8 on June 16-18; 5 on June 19-21; 8, 10, 12, and 8 on June 22-25; 1 on June 26-27; 5 on June 28-July 1; then 25, 20, and 8 on July 2-4; 5 on July 5-6; 8 and 10 on July 7-8; 8 on July 9-10; 5, 8, 12, and 8 on July 11-14; 5 on July 15-19; 10, 12, and 8 on July 20-22; 1 on July 23-24, and 5 on July 25-28. Sunspot numbers for June 9 through 15 were 22, 28, 40, 39, 27, 26, and 22, with a mean of 29.1. The 10.7 centimeter flux was 85.2, 84.9, 88.2, 94.1, 91, 87.6, and 87.3, with a mean of 88.3. Estimated planetary A indices were 4, 9, 11, 10, 9, 21, and 14, with a mean of 11.1. Estimated mid-latitude A indices were 5, 9, 11, 9, 10, 15, and 15 with a mean of 10.6. In Friday's bulletin look for reader reports on recent 6 meter propagation. Send me your reports and observations at k7ra@arrl.net.